There’s no doubt motherhood has its challenges. Between the non-stop nursing, debilitating sleep deprivation and an uptick in toddler tantrums, there are times the hubs and I feel like we’re barely hanging on these days. As easy as it is to get wrapped up in the day-to-day challenges of being a busy mama of two, this Thanksgiving I’m reminded of just how much we have to be thankful for. We have the sweetest, brand new baby girl to snuggle, a healthy, inquisitive, adventurous almost-2-year-old and a home filled with family, friends, laughter, and love. I never imagined my heart could feel this full. Speaking of full, when it comes to filling our bellies on Thanksgiving, mashed taters have my heart — and about 50 percent of the real estate on my plate. 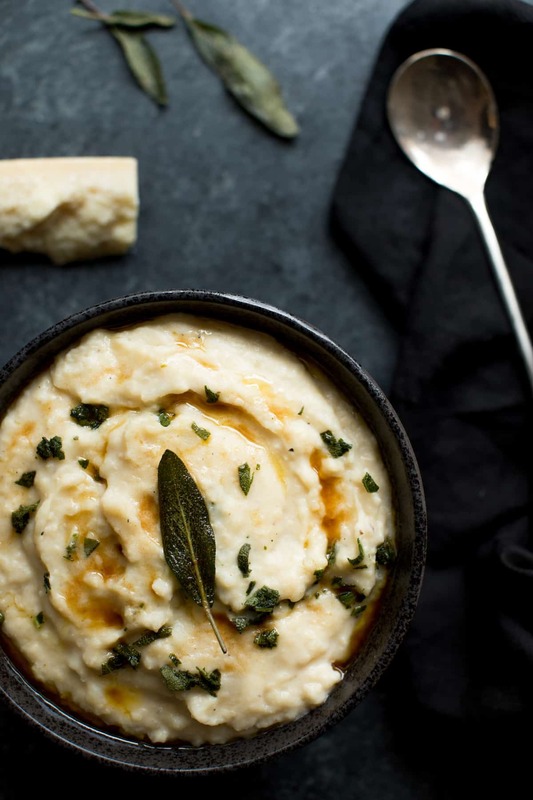 This cheesy, Slow Cooker Potato Cauliflower Mash especially so. 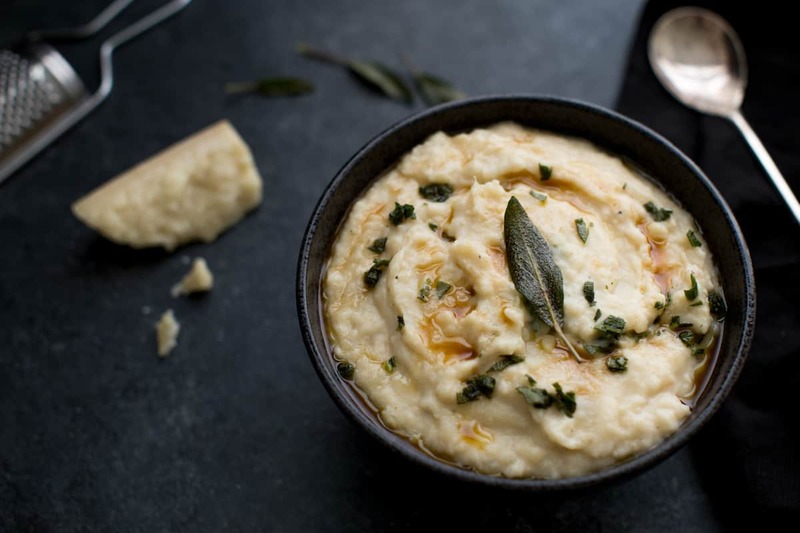 A combo of good ol’ russet potatoes and cruciferous cauli, this velvety, cheesy potato and cauliflower mash is everything your Thanksgiving menu needs this year. Sure the fried sage and brown butter make it look all fancy, but it might just be the simplest side dish of all time. After just a few minutes of prep, potatoes and cauliflower are bathed in milk broth, seasoned with garlic, salt, and pepper, and simmered for four(ish) hours in your slow cooker. Not only does this free up a burner on your stove, but there’s also no lugging a super heavy pot of hot water across the kitchen, no singeing your eyebrows with steam at the sink, and no dirtying a perfectly clean colander. 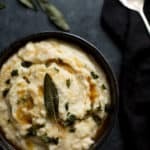 Cooked, mashed and served all in the slow cooker, this dish is the definition of “one-pot wonder.” And for those of you who have difficulty with timing as I do, this mash is happy being kept warm in the cooker while the rest of your meal comes together. What’s milk broth, you’re wondering? Sounds impressive, doesn’t it! All it is though is a smooth, flavor-filled broth made of chicken stock and wholesome milk. When simmered low and slow in milk broth, the taters and cauliflower absorb all of the flavor and creamy goodness — which, let me tell you, is a considerable step up from water-logged boiled potatoes. 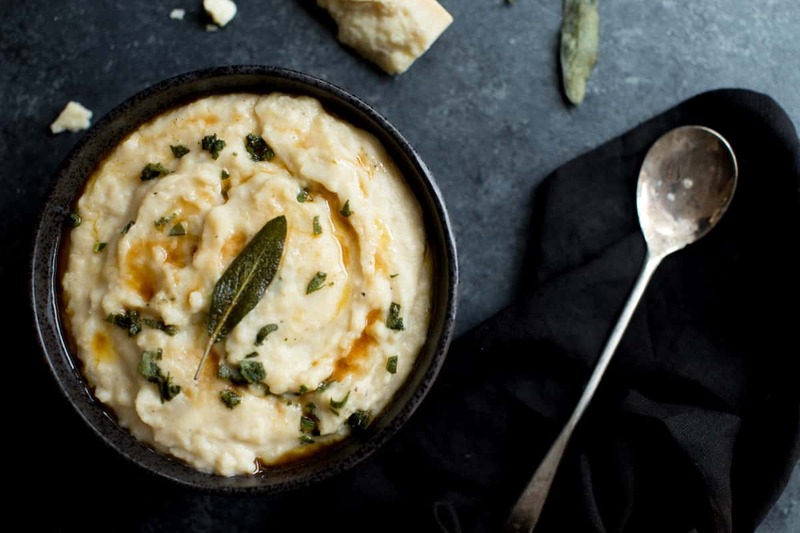 The consistency, texture, and flavor of milk offer a real culinary advantage here, resulting in a creamier, richer mash than if made with a non-dairy milk alternative. Plus, I feel good knowing milk also provides important nutrients my family needs. 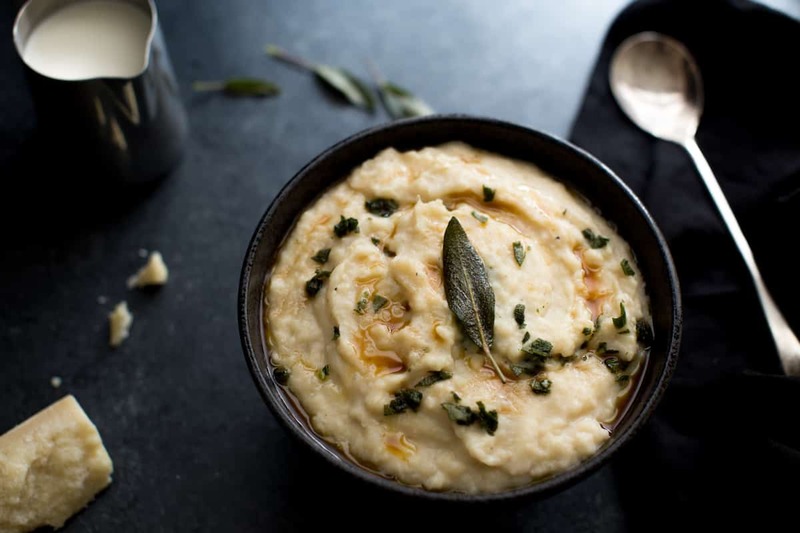 Once the potatoes and cauliflower have sufficiently softened and absorbed that milk broth goodness, they’re mashed to perfection and finished with a combination of cheddar, mascarpone and parmesan cheeses, more creamy, nutrient-rich milk and topped with brown butter and fried sage. 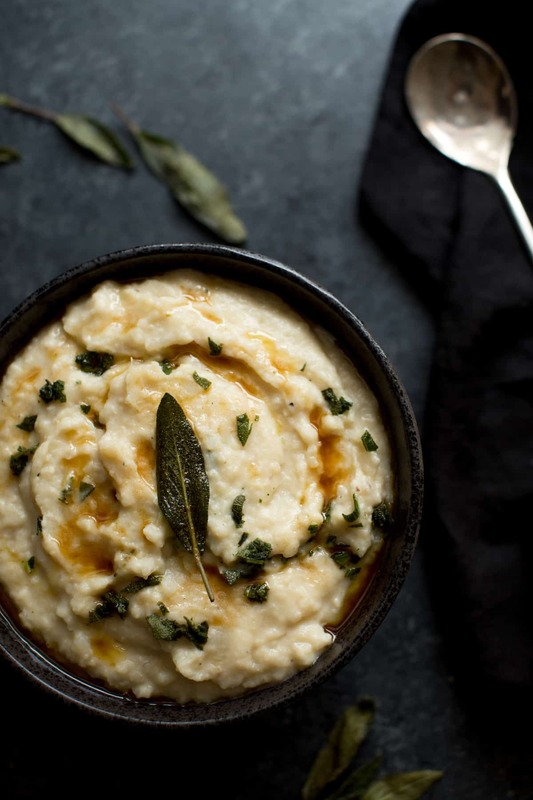 Given the trio of cheeses incorporated and the generous drizzle of brown butter on top, it’d be hard for me to lie and say this is low-cal mash. Of course, it could easily be lightened up by cutting back on the cheese and backing off on the brown butter, but I’m nursing a newborn, and this is a Thanksgiving dish. I’m not cutting corners — at least not Thanksgiving week. Instead, I am going to be thankful for all we have, including this bowl of creamy carbs and calories. Layer potatoes in the bottom of the slow cooker. Place cauliflower on top and add garlic, 1 cup milk, chicken broth, salt and pepper and toss to coat. Cover and cook until fork tender, about 4-5 hours on high or 6-7 hours on low, gently mixing once halfway through. Mash to using a potato masher or electric mixer. Stir in the cheeses, cover, and cook another 5-10 minutes or until cheese has melted. While the cheese melts, melt butter in a small skillet over medium heat. Swirling the pan occasionally, watch for the color to change from yellow to golden-tan to a warm brown. Once brown, add the sage and cook for 30 seconds, stirring once or twice. Remove skillet from heat. Transfer sage to a paper towel-lined plate to remove excess butter and then coarsely chop. Just before serving, heat remaining 1⁄2 cup milk in the microwave for 45-60 seconds and stir into potatoes until desired consistency is reached, adding more if necessary. Stir in browned butter and sage and season with additional salt and coarsely ground black pepper, if desired. There is no information about the fried sage or the brown butter – can you please add this information to the recipe as it sounds like this is the finishing touch. Sorry about that! Recipe is now updated. Thanks for noticing!